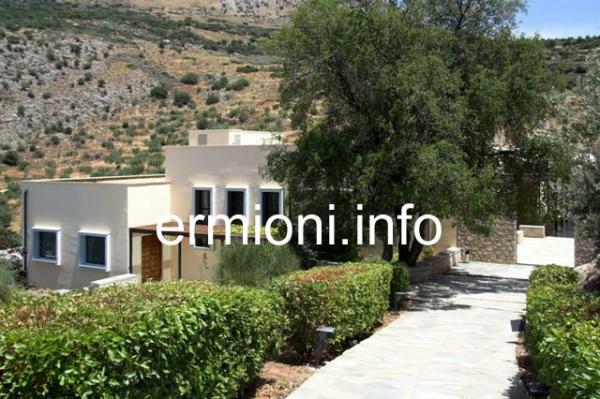 The ancient citadel of Mycenae (Mykines) is an imposing site on top of a rocky 278m hill. 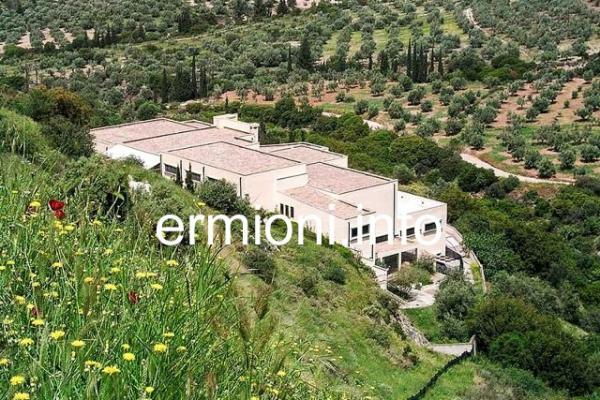 The citadel is half-hidden in a mountain recess between two triangular peaks: Profitis Ilias (750m) and Mount Zara (600m). It was the centre of power in Greece during the Bronze Age period, and protected by the famous Cyclopean stone walls. Mycenae was the place where Zeus, transformed himself into golden rain and visited the beautiful Danae. From this union, one of the best known Greek heroes and founder of Mycenae was born. His name was Perseus. It was Perseus who had the mythical Cyclops, the builders of nearby Tiryns, erect the 900m sandstone circuit-wall of the citadel, which includes the famous Lion(ess) Gate. In the Iliad, Homer describes archaic Mycenae as 'well-built', 'broad-streeted' and 'rich in gold'. 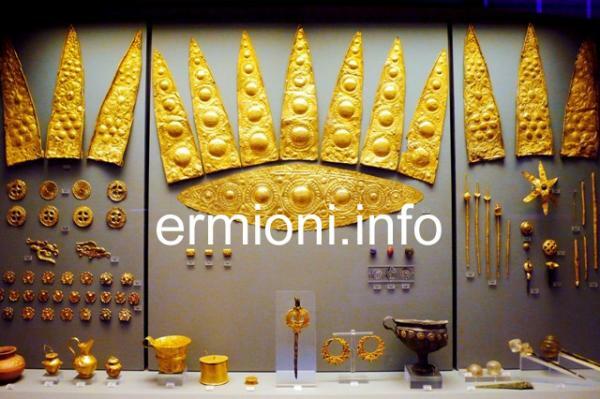 It was from Mycenae that King Agamemnon assumed the leadership of the Achaeans on their expedition to Troy, 1194-84 BC, in helping his brother, King Menelaus of Sparta, retrieve his wife, the beautiful Helen. Agamemnon was murdered on his return to Mycenae by his own wife, Clytemnestra, assisted by her lover, Aegisthus. In revenge of their father's murder, Orestes and Electra killed both their mother and her lover. It is believed that the citadel was finally destroyed by fire, approximately 1180 BC, when there was widespread destruction of Mycenaean citadels. The city dwindled into insignificance, allowing Argos to replace it as the political and religious centre of the Argolida. Much later, Mycenae sent men to support the Spartans at Thermopylae in 480 BC, and together with Tiryns, sent 400 men to the battle of Plataea in 479 BC, helping their Hellenic allies destroy the Persian invasion. After being forgotten for many Centuries, the exposed top section of the Lion(ess) Gate was 'rediscovered' in 1841 by the Greek Archaeological Society. In 1874, Heinrich Schliemann began his explorations of the Lion(ess) Gate and discovered Grave Circle A, two years later. More excavations continued by Christos Tsountas between 1884 and 1902. 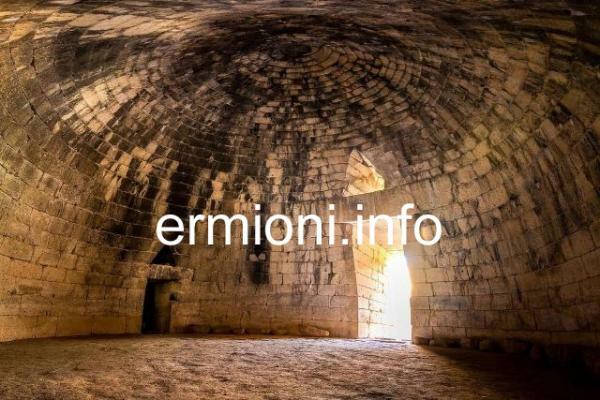 During this period, the megaron palace of the acropolis, the underground spring water cistern, two-storey buildings and many tombs which surrounded the defensive walls, were discovered. Excavation work continued in 1920 by A.J.B. Wace, the English archaeologist, with various interruptions until 1957. After this period, Lord William Taylour and Professor Mylonas of the Archaeological Society of Athens, completed the excavations of the area within the citadel by 1966. Today, after entering the citadel through the Lion(ess) Gate, one can walk through this historic fortress easily by following the concrete pathway ramp, which leads past Grave Circle A, and winds up to the acropolis and down to the North-East extension, which has the underground spring water cistern. Invisible from the outside, the secret water cistern was designed and built so that the citadel could withstand any prolonged seige. 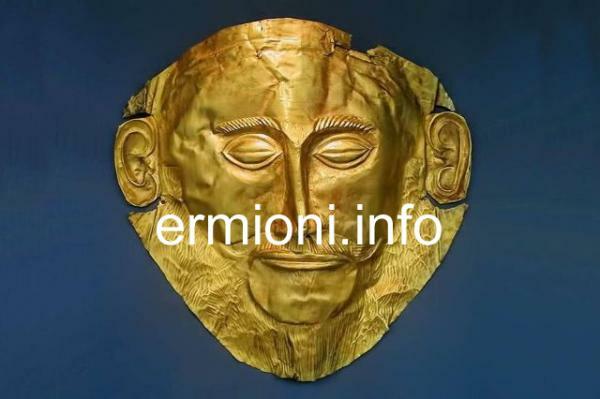 If you leave the citadel through the North Gate and make your way down to the museum, you will find many exhibits on display from the various excavations, including a replica of the famous golden death mask, which was found by Schliemann and is internationally known as the 'Mask of Agamemnon'. Once at Mycenae, in addition to the citadel and museum, another interesting site to visit is The Treasury of Atreus, which is built into another hill opposite the palace citadel, and is easily accessible from the road. 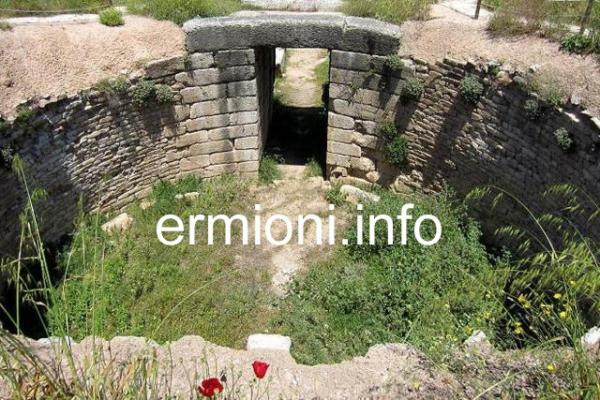 This large tholos tomb, also incorrectly known as the "Tomb of Agamemnon", is a very impressive monument. It was constructed around 1300 BC, much earlier than the Lion(ess) Gate, and was found empty, already robbed in antiquity. It was the Greco-Roman traveller Pausanias who tells us that the ancients themselves considered it to be the Treasury of Atreus and his family. 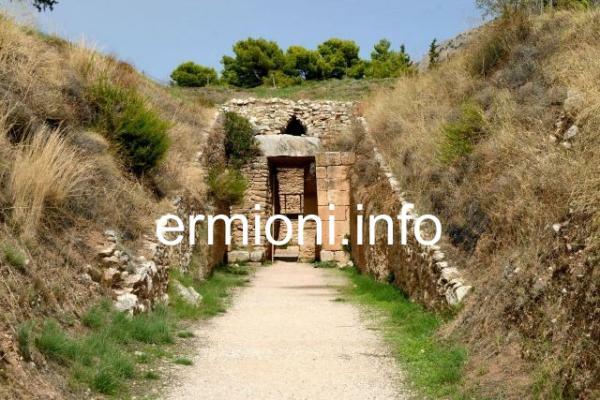 There are a number of tholos tombs surrounding the Mycenaean citadel, the Tomb of Clytemnestra near Grave Circle B, the Tomb of Aegisthus and the Lion Tomb, being located near to the citadel's Lion Gate. 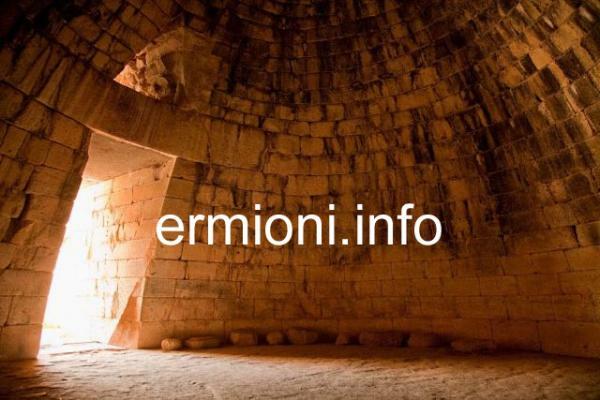 The journey from Ermioni to Mycenae will take you past the historical sites of ancient Epidavros, Nafplio, Tiryns and Argos. The small village of Mykines is situated a couple of kilometres before archaic Mycenae, where you will find some cafes, tavernas and a large selection of souvenir shops. Mykines is an ideal place to stop and have a refreshing drink or a meal, either before or after your visit to the ancient site. Alternatively, you can get refreshments from a large cantina which is situated in the official free car-park, just before the entrance to the archaological site and museum. 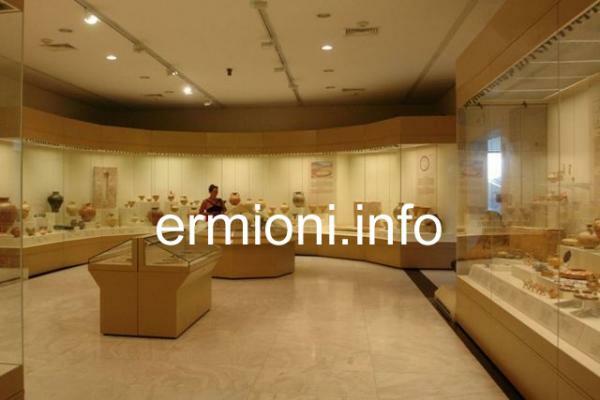 The museum is located next to the archaeological site, and has many important finds on display, however, the original and main artifacts from Mycenae are on display in the National Archaeological Museum in Athens. Mycenae is an exposed site, offering very little shade. In the hot Summer months, take a hat and plenty of water with you. When visiting the spring water cistern at the North-East extension, it is useful to take a torch with you. There are 101 steps leading underground, in three sections. The first few steps are lit by daylight, the remainder of the descent is in total darkness, as there is no electrical supply. Once inside the cistern cavern, you will notice the spring water level that left its mark around the ancient walls.